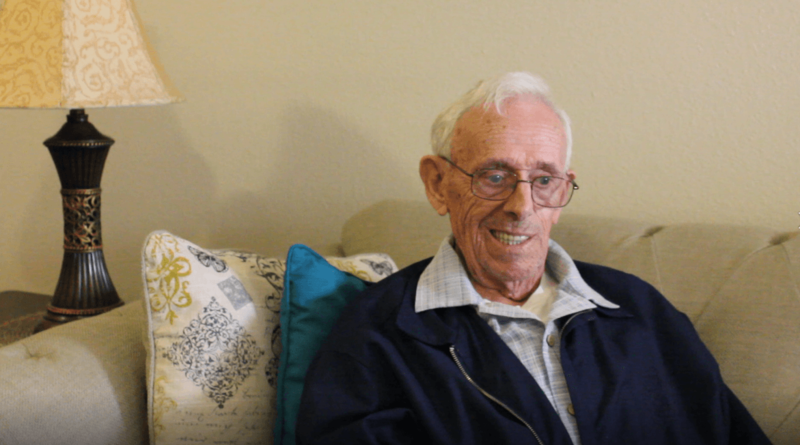 Assisted Living Resident Spotlight: Al P.
This month’s assisted living resident spotlight at Renaissance Village Rancho Belago is Al P. From an early age, Al P. had to grow up quickly. He was one of eight children of two parents who emigrated from Germany. They came from Germany through England and Canada into Halifax, Nova Scotia. They finally settled in Edmonton, Alberta, Canada. His father originally worked as a coal miner but didn’t like the work. He moved the family once more, settling on a farm in Ponoka, Canada. On the farm, they were almost completely self-sufficient. The family cared for their livestock. They also minded a garden where they grew all their food. In addition, they would buy only the things they couldn’t produce like sugar. He shares that the way they lived was a lot like what you see on Little House on the Prairie. Al’s parents spoke German around the house because they didn’t know English. They learned all their English from the kids. After a few years, his father knew enough that he could get around in town, but his mother never spoke it. The education he encountered was different from what kids experience today. There were only eight grades and one teacher. That teacher oversaw what everyone was doing and helped those who needed it. During the fall, the kids who lived on farms would start two months later. This was because their families needed their help during the harvest. Al also remembers having to drive the cattle up the road because they didn’t have enough pasture for them to feed. He’d also milk one of their eight milk cows each morning and night. One evening his mother shared she wasn’t going to be around much longer. She said the Lord was going to call her home, a few days later both of Al’s parents died in a bad car accident. This left all eight kids as orphans. Al feels it affected him most because his older siblings were working or had families of their own. He and his younger siblings went to live with their uncle. Al took care of their farm for the next three months, but then left it all to live with his uncle. His uncle treated him and his siblings like they were his own children. Al stayed there for the rest of the year, but after his oldest brother got married he left. He decided to start looking for work. After spending some time at the employment office he began work at TE Company in Canada as a stock receiver. It was hard work, but that’s something he knew well and excelled in. Two years later he left his job as head receiver. He had enough of the cold weather and after a visit to his sister in Long Beach, California he decided to move there. In 1957, the Soviet Union launched Sputnik, the first artificial earth satellite. During this time the Air Force continued to push forward. Al found himself working as an aircraft mechanic. They assigned him to work on a new airplane known as the 133. They sent him to work on WB – 47s with Strategic Air Command in Louisiana. However, because SAC was so secretive and he was from Canada, he wasn’t able to get the clearance he needed. After two years they sent him to Dover Air Force Base and he worked on 124s. During his time in the Air Force, he also spent time in Spain. He served for four years and left as a buck sergeant in the E-4 pay grade. After leaving the Air Force Al went into the airline industry. He landed a mechanic job with Pan American World Airways. Al had never worked on Boeing 707s, so they sent him to school to ensure he had proper training. While working for Pan Am, he met his first wife, Judith, during a dance at the local YMCA. He would drive 300 miles each weekend to spend time with her. However, her family was Catholic and he wasn’t. Her mother didn’t like this and wouldn’t allow them to get married. They went off to Long Beach, New York and the city’s mayor married them. The two found a home in Jamaica, Queens. Shortly after they left the east coast and moved out to California. Al worked for General Dynamics in Pomona, a company that did work for the space program. Unfortunately, he worked with a lot of chemicals that gave him headaches. As a result, it also interfered with his sleep. They moved and he worked on hydraulics in Fullerton at a division of North America Aircraft. He later worked another job hauling cargo through airports. But moved when a job at Continental Airlines at LAX opened up. Al stayed for ten years working on jets again and finally retired at Alaskan Airlines. He and his wife, Judith, had four children together. They had three boys, Al Jr., Michael, and Steve, and one girl, Nancy. Judith and Al were together for 18 years, but she later died from Lupus, a disease she had for over 20 years. Al did marry a second time, but the marriage didn’t work out. They were together for 18 years and then she decided she needed to be close to her family and left. Al enjoys living at our assisted living facility Renaissance Village. He shares he’s made lots of friends and likes spending time with them. He loves that there’s so much to do and says it’s better than anywhere he’s ever seen.